Florida State ("over/under" 9.5): The over is a strong favorite here at -155, but that is completely justified. The Alabama game to open the season is a very tough spot for them, and playing at Clemson is going to be a challenge - though not nearly what it would have been last year. A split in those games seems reasonable. And then it would be a bit of a surprise if they lost again. The trip to Florida to close the season is the next biggest concern, but I don't buy into that team like others do. The only way this team loses three or more is if they are mentally soft, and I don't fear that too much. I'm not going to mortgage my house to lock my money up for a season at this kind of return, but the price is more than fair. Alabama (o/u 10.5): Again the price is very low but not low enough to scare you off - the over is at -170. The Florida State game is a question, though Alabama is in a good position. And maybe LSU and Auburn will be tough, though I'm not at all convinced that either is on anywhere close to the same level as the Tide this year. And then they have a lot of games that won't be as tough as an average practice for the team is. Two losses this year would basically stop the world from spinning. Clemson (o/u 9.5): The under is actually favored at -125 here, which makes sense after losing the heart of the team like they did. I really like the value on the over here. They are going to struggle to beat Florida State, and winning at Louisville will be tough. Auburn could be tough, too, but I like Clemson at home in that one. They will get a win in at least one of those three, and the rest of the schedules are fairly manageable for a team as deep and well coached as this one. The over is solid. Florida (o/u 8): Jim McElwain just announced that he is 'starting' three quarterbacks in the opener against Michigan. There is no clearer sign that a team doesn't have a starting QB. I don't think that the team is beating Michigan, LSU or Florida State. That cuts down the margin of error significantly for the squad to go over, and they have a tough game against Georgia that I'm not that optimistic about, either. The over is highly favored at -165. I hate that number, but not enough to play the under at +135 - eight seems like a pretty reasonable number. Michigan (o/u 9): The over is at -125, and it's packed with value. The storyline that this team will struggle after major personnel turnover is tired and lazy - this is a deep and talented team. They are going to beat Florida to open the season. And eight more games they play. That gets them to the number. They then have three coin flip games - at Penn State and Wisconsin, and home against Ohio State. They will be competitive in all three and won't lose all of them. That gets them to the over comfortably. Nice play here. A total of 9.5 would be a different thing entirely, but at this price this is wildly playable - the team isn't losing four regular-season games. Oregon (o/u 8): The over is at +110, and it's worth a bit of a gamble - I like Willie Taggart and have faith that the program isn't as bad as they have looked the last two years. They are losing at Stanford and Washington, but they are fully competitive in every other game. Their third-toughest game is probably at UCLA, and I just hate the Bruins. This team won't win every game they should because they are still growing, but to go under they need to lose five times, and that doesn't feel hugely likely right now. I'll happily take the over at this price and accept that a refund of my bet is a viable possibility - and nothing to worry about. 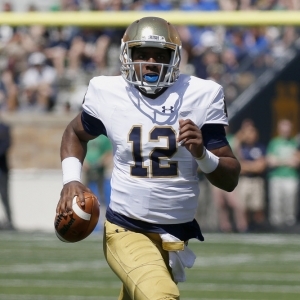 Notre Dame (o/u 7.5): The over is at -145. I don't have much respect for Brian Kelly and don't think last year was much of a shock, so I would love to take the under. Sadly, though, I can't justify it that easily. They are going to lose to USC and probably at Stanford. A home game against Georgia and a trip to Miami are both tough, too. They aren't going to lose all four games, though. And beyond that the schedule is weaker than it typically is for the Irish. They hit road games at Boston College, Michigan State and North Carolina at the right time - all three teams are struggling and aren't going to have great years. And Navy isn't as dangerous as they can be for Notre Dame. I don't see them losing five or more games. Sadly.